Caput succedaneum is the formal medical term the area of localized swelling or edema which is commonly present on the head of a newborn baby following vaginal delivery. Caput succedaneum is a very common and usually benign neonatal condition resulting from normal pressure and compression on the baby's head as it passes through the birth canal. Caput succedaneum itself is harmless as the swelling is limited to the scalp and is not a symptom of a deeper injury to the skull or brain. Although caput succedaneum itself is nothing to worry about, it can lead to other complications including newborn jaundice. The swelling in the head and scalp that characterizes caput succedaneum is the result of acute external pressures on the baby's head during labor and delivery. The primary source of this external pressure comes from the birth canal itself. In a normal vaginal delivery, the baby is pushed through the birth canal head first. This makes the leading part of the head the focal point of significant pressure as it pushes its way through the very narrow birth canal. These pressures are greater for babies that are macrosomic or after prolonged, stressful delivery. Swelling in the scalp can also be caused by early rupture of the fetal membranes during labor. Once the membranes rupture the amniotic sac is no longer available to act as a supportive cushion for the baby's head. Once the amniotic pillow is lost the baby's head is subject to greater pressure from the mother's pelvic bones. Caput succedaneum can also be triggered by the use of a vacuum extractor or forceps to facilitate a vaginal delivery. The primary symptom of caput succedaneum is swollen, puffy area on the head just under the skin of the scalp. The area will be soft to the touch and may appear on one particular side or extend across the middle of the scalp. The swollen spot typically appears on the part of the head that went first through the birth canal. Distinguishing the symptoms of caput succedaneum from other more serious types of head injuries with similar physical symptoms is important. Potentially dangerous conditions such as hydrocephalus also result in swelling in the head, but usually in a different area. A pediatrician should easily be able to differentiate between caput succedaneum and other more serious conditions based on simple physical examination. Caput succedaneum is not a condition that requires any treatment. The swelling of the scalp will almost always go away after just a few days without any treatment. Attempting to drain the fluid causing the swelling can actually make things worse and cause infections. In the vast majority of cases, caput succedaneum goes away on its own with any additional complications or long-term implications. In some cases, however, caput succedaneum results in bruising around the area of swelling. Bruising can cause an increase in bilirubin levels in the blood. Excess bilirubin levels are the underlying cause of newborn jaundice. So caput succedaneum can potentially lead to infant jaundice or make jaundice worse. When properly managed and treated (usually with exposure to sunlight) infant jaundice is not a serious condition. However, if jaundice is not monitoring and treated some cases can worsen and eventually lead to a very serious and potentially life-threatening condition called kernicterus. Kernicterus occurs when excess bilirubin in the blood begins to invade and damage the brain resulting in very serious and permanent brain damage. Even though it can potentially lead to complications like jaundice, caput succedaneum itself is not a serious concern. 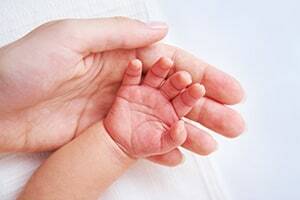 The real significance of caput succedaneum as it related to birth injuries is that it is often one of the first, most notable indicators that the baby went through a particularly difficult and stressful delivery. If a baby is born with a caput succedaneum it means that their head was subjected to significant external pressure during delivery. This could mean that the baby suffered a more serious brain injury as a result of the oxygen deprivation during the difficult delivery. Parents of a baby with caput succedaneum should accordingly be particularly attentive for signs and symptom of infant brain injury. What is the Difference Between Cephalhematoma and Caput Succedaneum? Cephalhematoma and caput succedaneum are both have similar causes, most notably the use of forceps or a vacuum, a difficult delivery, or anything that puts pressure on the baby's head. The difference between the two is that cephalhematoma refers to bleeding under the neonate's scalp. It is blood that is collected between the periosteum of the skull bone and the skull bone itself. Caput succedaneum involves a diffuse subcutaneous fluid collection unrelated to the periosteum with poorly defined margins. Again, this is most often caused by pressure on the scalp against the dilating cervix during delivery. Schwimer, S. R., Lebovic, J. (1986). In utero sonographic demonstration of a caput succedaneum. Journal of Ultrasound in Medicine, 5, 711-712. Lapeer RJ, Prager RW. Fetal head moulding: finite clement analysis of a fetal skull subjected to uterine pressures during the first stage of labor. Petrikovsky, B., et. al (1998). Cephalhematoma and caput succedaneum: Do they always occur in labor? American Journal of Obstetrics and Gynecology, 179, 906-908.